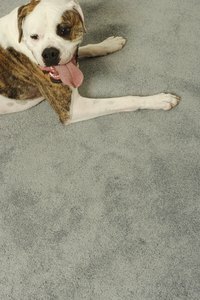 Can Dogs Be Allergic to Carpet Cleaner? Contact dermatitis is a skin problem dogs can develop after exposure to materials such as salt, fertilizers, flea collars or chemicals in cleaning supplies. Your dog’s skin can be irritated by a single exposure, or he may develop an allergic reaction to it. Although the rash looks the same in both cases, allergic reactions usually appear after many exposures, and the rash isn’t always limited to the point of contact. According to doctors at WebMD (webmd.com), carpet cleaner is a common source of irritation. Contact dermatitis causes itchy red bumps and blisters to appear on areas of the skin where there isn’t much hair. This includes the muzzle, feet and stomach. Your dog may also have runny eyes and nose, lose its hair and scratch a lot. Severely allergic dogs may develop hives or facial swelling. Symptoms often appear within 20 minutes of exposure. It can be hard to tell the difference between an allergic reaction and other problems such as sarcoptic mange, drug sensitivities or skin infections. Your vet will diagnose dermatitis with a skin scraping test. He will also ask you questions about shampoos, ointments and other products your dog comes into contact with. Confine your dog to a clean area until the dermatitis clears up. Prevent exposure to any substances you think are affecting your dog. Your vet may also prescribe antihistamines or steroids to relieve symptoms. Some drugs that are available for treatment are pednisolone, triamcinolone and chlorpheniramine. Dogs suffering from contact dermatitis often develop secondary skin infections. Your vet may prescribe an antibiotic ointment to treat them. Allergy shots aren’t recommended for dogs. Allergy medications can cause side effects in dogs, including vomiting, diarrhea, drowsiness, weight gain, water retention, dry mouth and increased thirst or hunger. If your dog exhibits side effects, contact your vet right away. Carpet cleaners contain chemicals like perchloroethylene, napthalene and propylene glycol methyl ether. If your dog is allergic to your carpet cleaner, make your own all-natural carpet cleaner by mixing ½ cup cornstarch with 2 cups of baking soda, one tbsp. ground cloves and five crumbled bay leaves. Sprinkle it on your carpet and vacuum it up after letting it sit for an hour. You can also remove stains from your carpet by adding 1 tbsp. liquid castile soap to a bottle that’s half filled with warm water. Fill the rest of the bottle with vinegar and spray on the stain. Rub with a damp cloth. Doctors Foster & Smith: Does Your Dog Have Allergies? AllergicPet.com: What's Behind Your Dog's Allergies?